This past Monday, February 8th 2010, at a meeting of NYC Pride (aka Heritage of Pride) it was announced that Lt. Dan Choi would be one of the Grand Marshals for the 41st Annual LGBT Pride March, which will occur on June 27th, 2010. When first approached about the request to be the NYC Grand Marshal, Lt. Choi responded with resounding excitement and a sense of honor for all who have struggled under this policy. Lt. Choi’s selection and acceptance of the honor of NYC LGBT Pride Grand Marshal marks the first time in U.S. history that an openly gay male on active service with the U.S. Armed Forces will be an LGBT Pride March Grand Marshal. More, and press release, after the jump. 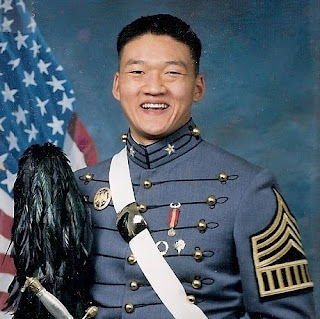 Lt. Dan Choi graduated from the US Military Academy at West Point in 2003 with a degree in Arabic and Environmental Engineering. He served as an infantry officer and served an extended combat tour in Iraq (2006-2007). His fluency in Arabic and West Point degree became very useful to the Army’s mission in Iraq as he did not need to use an interpreter. He served as a combat leader, government liaison, and reconstruction officer, rehabilitating water infrastructure. When he returned home he began his first love relationship with his current boyfriend, despite the ban on gay military service. He decided he could not lie about love and so left active duty in 2008. He continued to serve in the Army National Guard. As a founder of “Knights Out”, the West Point LGBT Alumni, he has been at the forefront of the repeal of the discriminatory Don’t Ask Don’t Tell (DADT) policy and reminds all soldiers that they are not alone and they should never be ashamed of being honest with themselves and others. He declared his sexual orientation publicly on national television, which resulted in a notification of discharge despite his desire to continue serving. However, as of February 5th, it was announced that Lt. Choi was placed back on active service with Army National Guard. Lt. Choi's selection as the NYC Pride Grand Marshal speaks volumes to the struggle for equality among the LGBT community. His presence as Grand Marshal for 2010 NYC Pride March will serve as a reminder that the struggle for equality continues. Michael Owen, an NYC Pride member, stated that “Lt. Choi’s presence as our Grand Marshal will send a strong message to Washington that the time has come to end the discrimination of “Don’t Ask Don’t Tell” and create an environment where our service men and women can serve their country in an honorable manner without having to hide who they are." Enacted under the Clinton administration in 1993, DADT has resulted in countless discharges of competent and much needed soldiers, many of whom like Lt. Choi speak fluent Arabic. It was the lack of Arabic speakers in our intelligence/defense forces that caused a delay in the translation of terrorist communications by Al-Qaeda. The paramount issue, in this writer's view, is that DADT forces our honorable men and women in service to live a lie, which is contrary to the core values that are instilled within the Armed Forces. Those who criticize the repeal of DADT, like Sean Hanity and Oliver North, they should wake up and smell the coffee. More than 2 dozen countries around the world (most of whom are our allies) allow LGBT people to serve openly in their armed forces, and the issue has not caused any disruption or problems. If the Greeks and Romans allowed gays to serve openly, why can’t we? By repealing the chains of DADT, we will free our soldiers from the stress of being in the closet while serving their country. Lt. Choi serves as a perfect example that we need not live under such repressive conditions and that the march of equality MUST move forward. If the Chairman of the Joint Chiefs and the Secretary of Defense can openly support the repeal of DADT, the hypocrites in Washington need to listen. For years we have heard our lawmakers constantly defer to our military commanders on how best to run the Armed Forces, and the repeal of DADT is no different. Justice and Liberty for all, no less no more. That is why we must repeal DADT. About NYC Pride: New York City’s annual Pride March began in 1970 as a commemoration of the one-year anniversary of the Stonewall Riots. The March has since grown to become the oldest and one of the world’s largest Lesbian, Gay, Bisexual and Transgender (LGBT) events. This year’s Pride March will begin at 12:00 noon on Sunday June 27th. Step-off for more than 350 groups and 500,000 participants will take place on 52nd Street and Fifth Avenue. The March then follows the Lavender Line to its conclusion at the intersection of Christopher Street and Greenwich Street. Longer than St. Patrick’s green line by many blocks, the Line is an identifying symbol of New York City’s Pride March and will mark all four miles of the March’s route. The route moves south on Fifth Avenue and turns right (west) on 8th Street and proceeds to the top of Christopher Street by the Jefferson Market Library. From here, the March will pass down Stonewall Place and the Stonewall Inn, site of the riots in June of 1969. For further information, please visit www.nycpride.org. The writer of this article is the current March Director of NYC Pride. 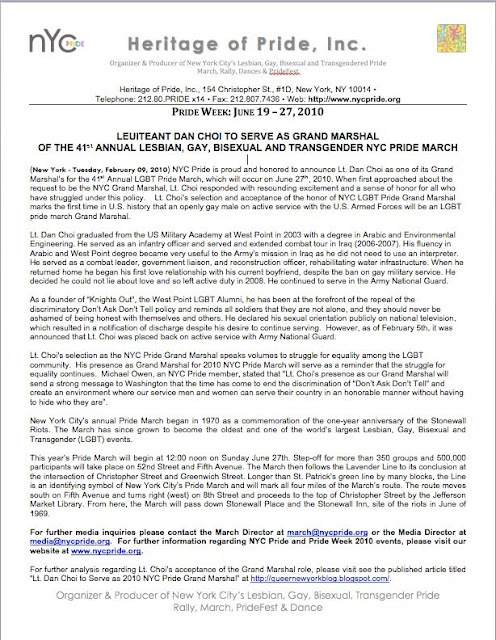 With all due respect, the only possible explanation for the major error in the press release is if honored guests of the 1975 gay pride parade in New York were not called "Grand Marshals." In 1975, TWO out, active duty gay males, Leonard Matlovich and Skip Keith, both in the Air Force until their discharges later that year, marched in the parade and spoke at the rally afterward, as did two out women Army servicemembers, Barbara Randolph and Debbie Watson. “Leonard Matlovich surveyed the throng with wonder. How had he allowed so much of his life to be wasted in loneliness. A cheer rose from the crowd when Matlovich delivered the line he had used in every newspaper and television interview since his case went public. With him were the other heroes of the moment: Staff Sgt. Skip Keith, Barbara Randolph and Debbie Watson. When the four of them stood side by side at the microphone, waving to the crowd that billowed through Central Park, a huge ovation rose up and it felt as if their spirits had also lifted into the air and soared over the city’s skylines. It was a moment Leonard would cherish for the rest of his life.” – Randy Shilts, Conduct Unbecoming. Further, unless by "active service" you only mean "in the military" and not "on active duty," the description does not fit the wonderful Dan Choi. He has not been technically on "active duty" the way Leonard and Skip were in June 1975 since 2008 but is a member of the standby National Guard. Given his many heroic accomplishments, and knowing him as I do, I'm confidant Dan would not want the erroneous impressions left as your word choices, I'm sure unintentionally, do. I have read your angry blog comments over the years, Michael, and I don't want to turn Queer New York into a shouting match. We are not that kind of blog. Maybe offline, you and Maurice Michaane can discuss the press release. I thinks its in bad taste,, to have a sell out on the Grand marshal of this year pride.. If Dan was a true advocate for the repeal of DADT he would have refuse to return to his post till all those affect by DADT could do the Same.. This is one reason why our community is so pick on.. I strongly disagree with sickntired. In fact I respect Dan even more now, because he is keeping to his solemn promise to protect and defend this country. The fact he was called back to service and agreed to return, shows that even in the face of adversity Lt. Choi's moral compass has never wavered. Lt. Choi's primary obligation is to his country and to fulfill the promise he made to defend it. While his fight for civil rights is leading towards the march of equality, his #1 priority is to keep the promise to defend his homeland, the USA. G-d Bless Lt. Choi and his valiant efforts in the duty of our country. V2G. I Want This NOW. Not 20 Years From Now. Tea Baggers Can't Even Spell "Learn English!" Betty Buckley "For The Love of Broadway"
Which way to the toilet?